The nasoethmoid fracture represents a challenging surgical problem due to the complexity and density of the anatomic components of the area. Because of the functional and aesthetic implications of the medial canthus, nasolacrimal system, and intraorbital contents, appropriate and timely treatment is crucial to avoid unfavorable sequelae. For excellent patient education resources, visit eMedicineHealth's First Aid and Injuries Center and Eye and Vision Center. Also, see eMedicineHealth's patient education articles Broken Nose, Facial Fracture, and Black Eye. Nasoethmoid fractures typically result from a forceful blow to the central aspect of the mid face. Motor vehicle accidents are the most common source of injury, followed by assault. Most naso-orbito-ethmoid (NOE) fractures result from motor vehicle accidents or assault. Possibly due to the advent of safety air bags in most newly produced vehicles, the incidence of these injuries is decreasing. Because the skeletal framework of the area is maximally supportive against forces in the vertical axis but weak in the horizontal axis (particularly against anteroposterior forces), central facial impact is likely to cause these types of injuries. Furthermore, the anterior prominence of the NOE complex in the mid face makes it susceptible to injury. In cases in which NOE fractures occur with comminuation of bone, if the fracture segments are displaced, the nasal bones and frontal process of the maxilla may be telescoped posteriorly beneath the frontal bone. In patients with comminution, the bony segments may spread into adjacent spaces. They may spread medially into the nasal cavity, superiorly to the anterior cranial fossa, and laterally into the orbit. For this reason, high-energy impact may lead to cerebrospinal fluid (CSF) leak, cerebral injury, or globe injuries. When telecanthus occurs, the medial canthal tendon (MCT) has become displaced from its native position. Usually, the tendon remains attached to a segment of bone that has become displaced. For telecanthus to occur, the fracture must involve at least 4 sites: the medial orbital wall, the nasomaxillary buttress/inferior orbital rim, the frontomaxillary junction, and the lateral nasal bone. 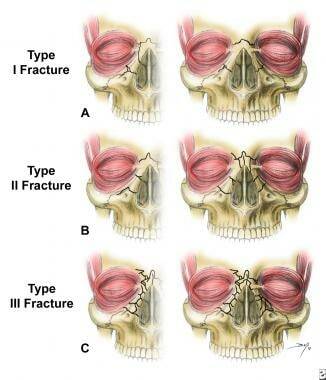 Naso-orbito-ethmoid complex fractures are classified according to 3 types. (A) Type I fractures involve a single, noncomminuted, central fragment without medial canthal tendon disruption (left-unilateral, right-bilateral). (B) Type II fractures involve comminution of the central fragment without medial canthal tendon disruption (left-unilateral, right-bilateral). (C) Type III fractures result in severe central fragment comminution with medial canthal tendon disruption (left-unilateral, right-bilateral). Type I: The simplest NOE fracture has no comminution and involves only the portion of the medial orbit that contains the MCT. In type I fractures, the bony segment attached to the MCT may be returned to anatomic reduction by aligning the bone to the surrounding medial orbital wall. These fractures may be bilateral, complete, or displaced. Uncommonly, the MCT is torn or avulsed completely from an intact medial bony wall. See A in the image above. Type II: These fractures are complete and involve comminuted bone external to the insertion of the MCT. In these cases, the fracture line does not extend to the bone immediately underlying the canthal insertion. Therefore, the MCT maintains continuity with a relatively large fracture segment of bone, which may be used in the surgical reduction. See B in the image above. Type III: These fractures are typically bilateral and complete and involve comminution of bone beyond the insertion of the MCT. The fracture line extends into the area of canthal insertion. Typically, the MCT is not avulsed, but the bony segment to which it is attached is usually too small to use in reconstruction. See C in the image above. Information regarding the mechanism of the injury may assist in determining a diagnosis. In particular, the magnitude, location, and direction of the impact are helpful facts. High-energy trauma should cause concern about other possible concomitant injuries. A history of mental status changes or loss of consciousness should cause concern regarding intracranial injury. The presence of any functional deficiencies, such as those related to airway, vision, cranial nerves, occlusion, or hearing, may provide clues to fracture location and resultant nonosseous adjacent injury. Evaluation of the maxilla and facial bones should be undertaken only after the patient has been fully stabilized and life-threatening injuries have been addressed. In particular, airway considerations and intracranial injuries must take immediate priority. In general, patients with facial fractures have obscuration of their bony architecture with soft tissue swelling, ecchymoses, gross blood, and hematoma. Nonetheless, observation alone may be informative. Focal areas of swelling or hematoma may overlie an isolated fracture. Periorbital swelling may indicate LeFort II or III fractures. Inspection of the NOE region may be obscured by diffuse edema and ecchymosis. These findings should cause concern about a possible underlying fracture. Palpation may reveal mobile bony segments, step-offs, or crepitus, all of which suggest fracture. Measurements of the intercanthal distance should be compared to the interpalpebral distance of the eyes. If the former is significantly larger than the latter, traumatic telecanthus from NOE fracture is presumed. In patients in whom edema makes localization of the medial palpebral angle imprecise, an alternative measurement is interpupillary distance, which should be approximately double the intercanthal distance. If intercanthal distance exceeds one-half the interpupillary distance, traumatic telecanthus must be considered. Another test for the integrity of the MCT is the eyelid traction test. The examiner grasps the lower lid in question and pulls laterally while palpating the nasal root. A lack or reduction of tension with lateral pull suggests NOE fracture with MCT displacement. A thorough eye examination with visual acuity, pupillary responses, and extraocular motion is crucial. Close inspection of the lower lid may reveal a rounded medial palpebral fissure and lid laxity. Although epiphora may be associated with NOE fractures, its presence is an unreliable indicator of injury. Lacrimal function may be assessed more accurately by placing irrigation and probing in conjunction with the Jones dye test of lacrimal function. Any fluid from the nose should raise the possibility of a CSF leak. If enough fluid can be collected, it should be sent for analysis of beta2-transferrin, an indicator for CSF. A cruder test for CSF may be performed by collecting a few drops of fluid on filter paper and examining the pattern of migration of fluid. Blood and water tend to form a central pool, while CSF tends to form a second outer ring. Naso-orbito-ethmoid (NOE) fractures are usually associated with significant cosmetic and functional sequelae. Expeditious definitive therapy is needed to best correct these problems. Thus, most of these fractures should be reduced and repaired surgically. The NOE complex represents a bony confluence that separates the nasal, orbital, and cranial cavities. The nasal, frontal, maxillary, ethmoid, lacrimal, and sphenoid bones contribute to the naso-orbito-ethmoid (NOE) complex. See the image below. 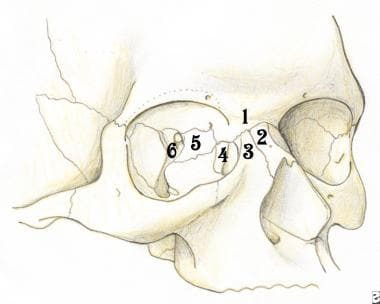 The naso-orbito-ethmoid complex is composed of a confluence of several bones: (1) frontal bone, (2) nasal bone, (3) maxillary bone, (4) lacrimal bone, (5) ethmoid bone, and (6) sphenoid bone. The frontal process of the maxilla, nasal bones, and maxillary process of the frontal bone provide the vertical support buttress of the NOE complex. This pillar forms the template upon which other more fragile structures are connected. The medial wall of the orbit is composed of the lacrimal bone anteriorly and the delicate lamina papyracea of the ethmoid bones posteriorly. These structures are susceptible to comminution, allowing for a medial displacement of the orbital contents after blunt trauma (medial blowout). Superiorly, the thin ethmoid bones form part of the floor of the anterior skull base. In this region, dural injury and resultant CSF leak is possible. The anterior and posterior ethmoid foramina are located at the superior aspect of the ethmoid bone in the frontoethmoid suture. Shearing of the corresponding arteries that traverse these foramina may result in orbital hematoma. The optic canal is positioned farther posteriorly and is less commonly distorted by the fracture lines. However, local edema within the optic canal or free bone fragments may lead to a disturbance in the vascular plexus of the optic nerve, leading to temporary or permanent blindness. The interorbital space between the orbits and beneath the anterior cranial fossa is composed of paired ethmoid sinus labyrinths. These structures are separated by the midline perpendicular plate of the ethmoid and reinforced by the midline cribriform plate. The roof of the interorbital space is the skull base, and the posterior border is the sphenoid bone. High-energy blunt trauma to the NOE complex may result in collapse of the interorbital space and concomitant injury to the anterior cranial contents (frontal lobe) or intraorbital contents. The MCT is a crucial soft tissue component of the NOE complex. This structure represents a medial fusion of the superficial and deep heads of the orbicularis oculi muscle and inserts via 3 limbs to the medial orbital wall. The superficial muscle forms the anterior and superior limbs of the tendon, which insert into the anterior lacrimal crest. The deep muscle forms the posterior limb of the tendon, which inserts onto the posterior lacrimal crest. The medial canthus thus completely invests the lacrimal sac, which is seated within the lacrimal fossa. The action of the muscles and tendon thus allow for a pumping action of the lacrimal sac and ducts, allowing for propagation of tears through the nasolacrimal system. In addition, the MCT acts as a suspensory sling for the globe, maintaining its support along with the lateral canthal tendon. Finally, the MCT ensures close apposition of the eyelid to the globe (see the image below). The medial canthal tendon is composed of 3 limbs. The superior and anterior limbs are the condensation of the superficial aspect of the pretarsal and preseptal orbicularis oculi muscle. The posterior limb arises from the deep head of the muscle. Specific contraindications include optic nerve injury and globe injury (eg, hyphema, rupture, laceration). In these patients, swelling from osseous manipulation may exacerbate damage to the eye. These issues must be addressed and stabilized prior to attempting to repair the NOE fracture. Consultation with an ophthalmologist is crucial in such patients. Gulses A, Varol A, Gayretli O, Kocabiyik N, Sencimen M. Anthropometry of the medial canthal ligament related to naso-orbitoethmoidal fractures. J Craniofac Surg. 2012 Jul. 23(4):1151-3. [Medline]. Potter JK, Muzaffar AR, Ellis E, et al. Aesthetic management of the nasal component of naso-orbital ethmoid fractures. Plast Reconstr Surg. 2006 Jan. 117(1):10e-18e. [Medline]. Ricci JA, Tran BNN, Ruan QZ, Lin SJ, Singhal D, Lee BT. Comparing Head and Facial Computed Tomographic Imaging in Identifying Operative Facial Fractures. Ann Plast Surg. 2018 Jan 9. [Medline]. Huang LK, Wang HH, Tu HF, Fu CY. Simultaneous head and facial computed tomography scans for assessing facial fractures in patients with traumatic brain injury. Injury. 2017 Jul. 48 (7):1417-22. [Medline]. Pham AM, Rafii AA, Metzger MC, et al. Computer modeling and intraoperative navigation in maxillofacial surgery. Otolaryngol Head Neck Surg. 2007 Oct. 137(4):624-31. [Medline]. Rosenberger E, Kriet JD, Humphrey C. Management of nasoethmoid fractures. Curr Opin Otolaryngol Head Neck Surg. 2013 Aug. 21(4):410-6. [Medline]. Yabe T, Ozawa T. Treatment of nasoethmoid-orbital fractures using Kirschner wire fixation of the nasal septum. J Craniofac Surg. 2011 Jul. 22(4):1510-2. [Medline]. Wolff J, Sándor GK, Pyysalo M, Miettinen A, Koivumäki AV, Kainulainen VT. Late Reconstruction of Orbital and Naso-orbital Deformities. Oral Maxillofac Surg Clin North Am. 2013 Nov. 25(4):683-95. [Medline]. Crockett DM, Funk GF. Management of complicated fractures involving the orbits and nasoethmoid complex in young children. Otolaryngol Clin North Am. 1991 Feb. 24(1):119-37. [Medline]. Cruse CW, Blevins PK, Luce EA. Naso-ethmoid-orbital fractures. J Trauma. 1980 Jul. 20(7):551-6. [Medline]. Ellis E 3rd. Sequencing treatment for naso-orbito-ethmoid fractures. J Oral Maxillofac Surg. 1993 May. 51(5):543-58. [Medline]. Fedok FG. Comprehensive management of nasoethmoid-orbital injuries. J Craniomaxillofac Trauma. 1995. 1(4):36-48. [Medline]. Heine RD, Catone GA, Bavitz JB, et al. Naso-orbital-ethmoid injury: report of a case and review of the literature. Oral Surg Oral Med Oral Pathol. 1990 May. 69(5):542-9. [Medline]. Holt GR, Holt JE. Nasoethmoid complex injuries. Otolaryngol Clin North Am. 1985 Feb. 18(1):87-98. [Medline]. Leipziger LS, Manson PN. Nasoethmoid orbital fractures. Current concepts and management principles. Clin Plast Surg. 1992 Jan. 19(1):167-93. [Medline]. Mathog RH. Posttraumatic telecanthus. Mathog RH, ed. Maxillofacial Trauma. Baltimore, Md: Williams & Wilkins; 1984. 303-17. Rhee JS, Chen CT. Endoscopic approach to medial orbital wall fractures. Facial Plast Surg Clin North Am. 2006 Feb. 14(1):17-23. [Medline]. Sargent LA, Rogers GF. Nasoethmoid orbital fractures: diagnosis and management. J Craniomaxillofac Trauma. 1999. 5(1):19-27. [Medline]. Vora NM, Fedok FG. Management of the central nasal support complex in naso-orbital ethmoid fractures. Facial Plast Surg. 2000. 16(2):181-91. [Medline]. (A) In rare instances, the medial canthal tendon is avulsed from the central bony segment. (B, C) The angular artery may be encountered in the subcutaneous plane in the approach to the medial orbital wall. The artery may be controlled with suture ligation or cautery. Dissection along the medial orbital wall should be performed carefully to avoid damaging the lacrimal sac or further disrupting the already damaged structures. Dissection should proceed toward the anterior and posterior lacrimal crests, which are the insertion points of the medial canthal tendon. (A) In those cases in which the medial canthal tendon is avulsed from its bony insertion, the tendon retracts laterally toward the lids. The free end of the tendon should be grasped and, when pulled medially, should result in tightening of the lids. (B, C) The tendon must be reattached to the bony medial orbital wall. 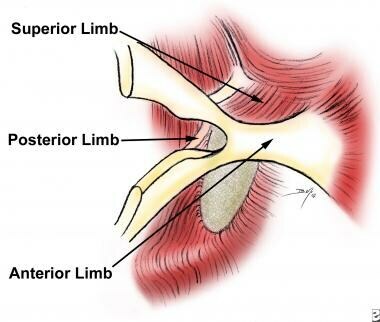 In order to restore the anatomic medial, superior, and posterior vectors of tension, the fixation point should be in the region of the posterior lacrimal crest. The tendon should be fixed with thick-gauge nonabsorbable suture, and screw holes, either at the posterior lacrimal crest or around a screw in this region, should be used for fixation. (A) An example of a unilateral type II or III fracture in which the central fragment cannot be easily attached to adjacent ipsilateral bone and thus requires transnasal wiring for fixation. (B) The central segment is secured with a 30-gauge wire, which is passed with a large, curved needle. The first end of the wire must penetrate the ipsilateral medial orbital wall above the lacrimal sac; then proceed posteriorly, superiorly, and medially through the nasal septum; and finally pass through the opposite medial orbital wall. The remaining end of the wire is then passed with another needle in a similar fashion. (C) The 2 free ends of the wire are retrieved at the opposite medial orbital wall and either twisted together or secured onto a screw fixed in the bone.